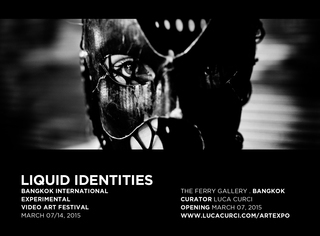 International ArtExpo and The Ferry Gallery are proud to announce the opening of LIQUID IDENTITIES, international experimental video-art festival which will be held in Bangkok (Thailand) at The Ferry Gallery, from the 07th to the 14th of March 2015. The event will be curated by Arch. Luca Curci (founder of LUCA CURCI ARCHITECTS, International ArtExpo and It’s LIQUID Group). The opening of the event will be on March 07, 2015 at The Ferry Gallery, starting from 05.00 PM. LIQUID IDENTITIES explores all the different facets of social, physical and cultural identities of our contemporary societies. Everyday we deal with a multitude of different identities and roles: we face the public life creating and adapting our social identities; our body and aesthetic tastes modify and are modified by our physical and sexual identities; our whole being evolves as well as contemporary cultures and modern cities do. Differences create new compounds and exchange possibilities. The Ferry Gallery is a public contemporary art space on privately owned ferry operating on the Chao Phraya River in Bangkok. The gallery was founded on January 2014 by Thai artist and entrepreneur Kawita Vatanayankur, as a mean to promote the contemporary art scene in the capital city and to bring contemporary art to the masses. The sheer number of daily cross-river commuters puts The Ferry Gallery in a special spot where large number of audience is guaranteed and often repeated, thus creating opportunity for maximum exposure for the works exhibited.